돌체&가바나 남성 꾸뛰르, 높이 날다! 자신감 넘치는 남자의 패션은 이제 여자가 사다 준 소심한 것들에서 벗어나고 있다는 현실에 대해 무슨 증거가 더 필요할까? 도메니코 돌체와 스테파노 가바나가 최초로 선보이는 알타 사르토리아(Alta Sartoria) 컬렉션이 여성 알타 모다의 발레에 이어 곧 등장했다. 밀라노에서는 두 오뜨 꾸뛰르 쇼가 이틀 연속 동일한 고객들, 세계 각국의 슈퍼리치들을 대상으로 열렸다. 이 아이디어는 남자들이 지갑을 열 두 번째 기회를 주자는 거였다. 이번에는 스스로를 위해서 말이다. 나는 스테파노가 쇼 시작 전에 자신의 저택에서 보여준 남성용 벨벳 자켓의 환상적인 자수에 넋을 잃었고, 심지어 부럽기까지 했다. 런웨이에서 본 남성용 데이웨어는 여성용과 비교해 오히려 눈에 띄게 장식적이고 화려했다. 이곳엔 휘황찬란한 단추가, 저곳엔 퍼 칼라가, 그리고 하얀색 퍼 스카프에는 어민 족제비의 꼬리들까지 달려있었다. 하얀색? 그래, 모델들이 바닥까지 내려오는 그레이트 코트를 휙 하고 스치며 지나가자, 이는 마치 러시아의 신흥부호 울리가르히들을 위한 새로운 여름용 가림막처럼 보였다. 신발로 말할 것 같으면, 여성들이 섬세하게 자수를 놓은 스타킹에 만족해했다면 남성용 신발은 컬러풀한 악어가죽 브로그에서부터 현재 판매중인 금박자수의 벨벳 이브닝 슬리퍼에 이르기까지 훌륭했다. 잠재고객들은 한낮에 열린 쇼에서 전혀 거리낌없이 그런 신발들을 신고 있기도 했다. 만약 누군가 이목을 끄는 브로케이드 자켓이 필요하다면, 돌체&가바나의 알타 사르토리아는 남성패션으로서 추구할 수 있는 가장 높은 수준과 스타일을 장인정신과 함께 담고 있다 할 수 있겠다. Who needs any more proof that self-confident men’s fashion is taking over from the timid women’s offering? 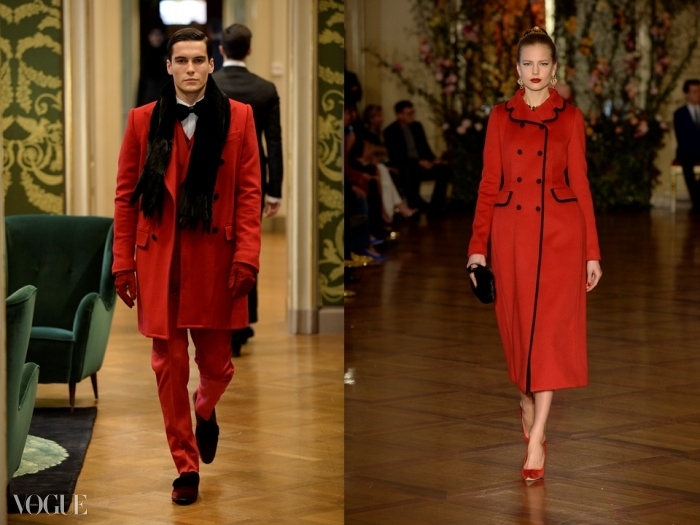 The first ever Alta Sartoria collection from Domenico Dolce and Stefano Gabbana followed hard on the ballet-slipper heels of the women’s Alta Moda. 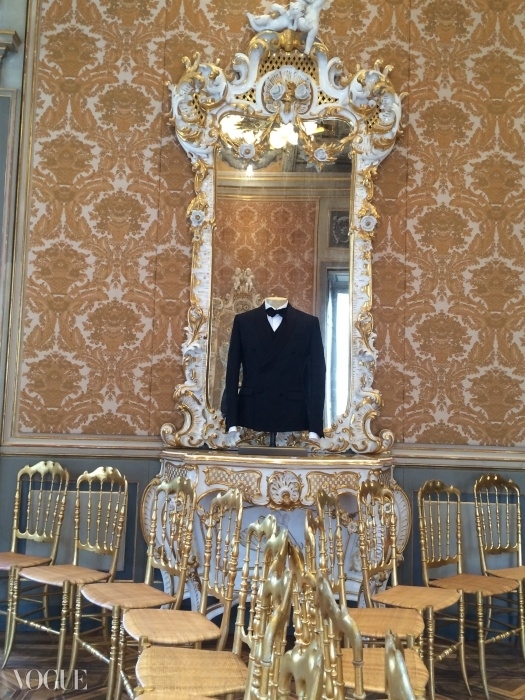 The two haute couture shows in Milan on consecutive days were aimed at the same customers: the global super rich. The idea was to give a second chance to the men to open their wallets – this time for themselves. 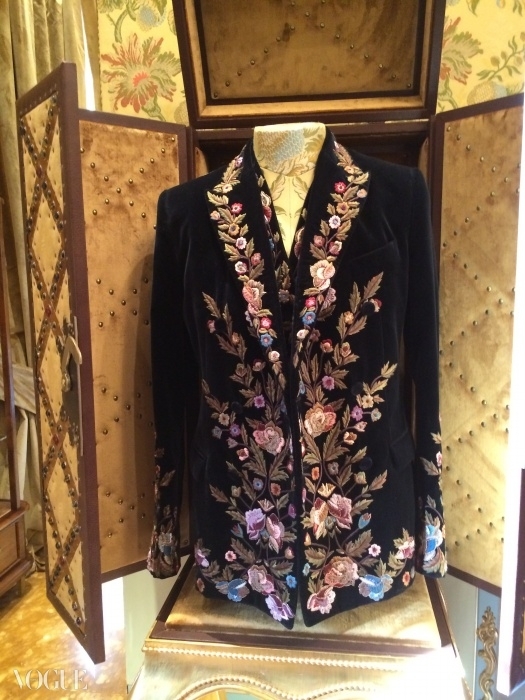 I was stunned – and rather envious – of the fantastical embroideries on men’s velvet jackets, which Stefano showed me on display in the palazzo before the show. 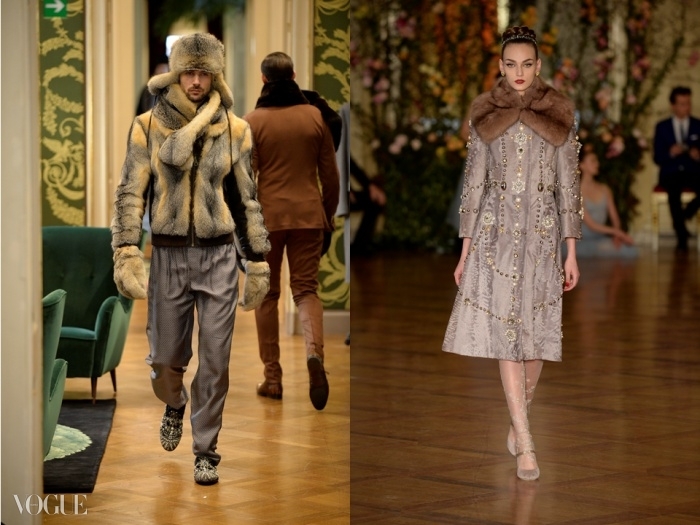 On the runway, the men’s day clothes were noticeably just that little bit more decorative and fanciful than the women’s: glam buttons here, a fur collar there, even ermine tails on one white fur scarf. White? Yes, it seems to be the new summer shade for oligarchs and their like, as they swoosh out in floor-length greatcoats. 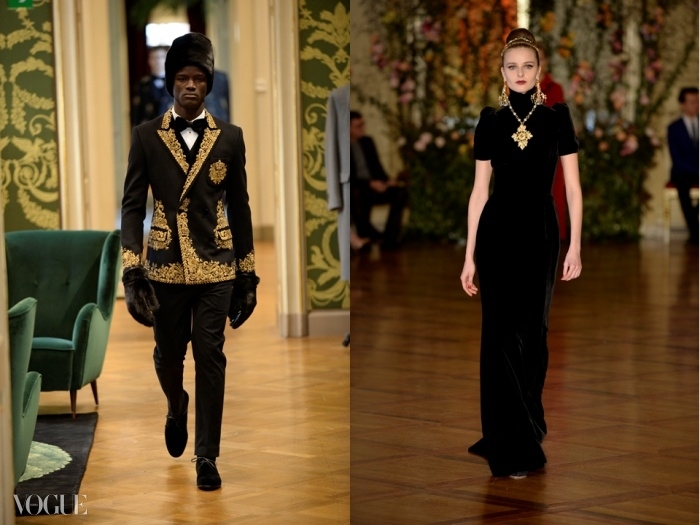 As for the shoes – while women had to be content with delicately embroidered hose, the men’s footwear rocked, from colourful crocodile brogues to the currently on-sale gilt-embroidered velvet evening slippers. Potential clients were wearing them at the show in the middle of the day – no guilt attached. 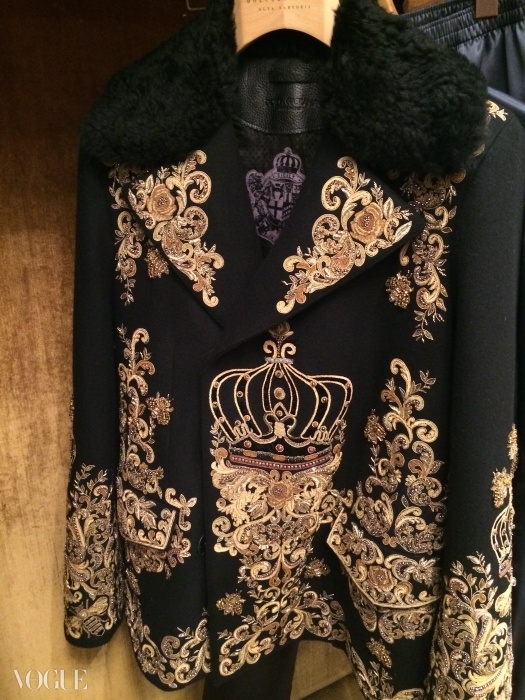 If a man wants to be noticed for the cut of his brocade jacket, Dolce & Gabbana’s Alta Sartoria is about as high, in craftsmanship, quality and style, as men’s fashion can get.